I have been looking with great interest at boot loaders design in recent months. It all started with the “Graphics, Touch, Sound and USB” book I published last year, where I used Mikromedia boards as my primary hardware platform to illustrate how easy it was to adapt the Microchip Library of Applications (MLA) to fit a custom design. 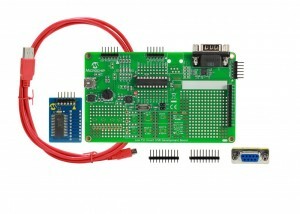 Those boards all come pre-loaded with a clever USB boot loader (based on the USB HID class). The fact that MikroElektronika provided a Windows-only application, motivated me to learn more about it and write a platform agnostic version of the Loader application (using Python) for all my Linux and Mac readers! Later came a new 8-bit project. An Intelligent Power Supply module featuring the PIC16F178x family. Half way through the design of a basic firmware framework, I realised that without an I2C boot loader this project would have been very user unfriendly, so I set off to write one. In the process, I learned a lot about writing boot loaders using the XC8 compiler (more on this in a future post). Most importantly, I learned a lot about the challenge to make a boot loader fit in the smallest code-protection unit (512 words) available on a PIC16F micro controller. Writing an I2C boot loader (in C) that uses less than 512 instructions is relatively hard. But if you know a little about USB, you might assume that writing a USB boot loader that fits in the same space is simply impossible. Matt squeezed the USB stack code down using some tough assembly on the little PIC micro and wrote an equally short and elegant script in Python to provide a PC application (across all platforms). When in “boot mode” the micro appears on the USB bus as a CDC (serial port) device so that .HEX files can be passed to the micro controller ( with MPLAB XC8 use the –offset:200 option when compiling your apps for later use with the loader). I checked out the project on my Mac (running Yosemite) and used the USB Low Pin Count demo board (DM164127-2) to try my code. I am glad to report that it worked at first try! Peter’s approach has the benefit of a stronger CRC protection/verification of the code being loaded but also implements the Device Firmware Update (DFU) specific USB class, which makes the little boot loader compatible with standard tools such as dfu_util . The only drawback is that now the original .hex file obtained by the standard MCHP toolchain has to be converted to a .dfu file before use with the loader application. Not a big deal, as Peter provides a convenient tool that performs such translation. I checked out this project as well, and I am glad to report that it worked flawlessly on my Mac running OS X Yosemite. This entry was posted in I2C, PIC16, Python, Tips and Tricks and tagged Bootloader, PIC16, USB. Bookmark the permalink.